The tutorial that we wanna discuss about iPad 4 here is the one who has Wi-Fi plus Mobile Carrier supports (You might had the iPad 4 Wi-Fi only). 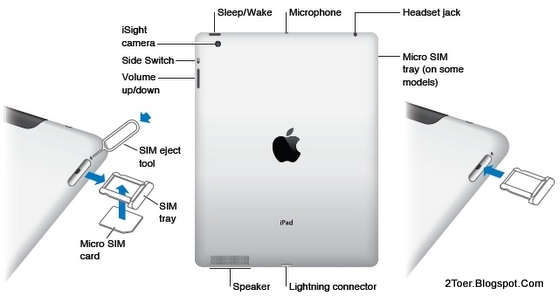 That is why we present the instruction on how you can eject the sim card tray and inserting the microSIM card to iPad 4 Wi-Fi + 4G (or 3G), in which this guidance didn't need on iPad 4 Wi-Fi only. 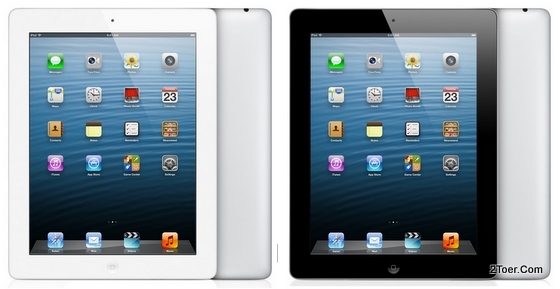 For your information, this iPad 4 uses LED backlit IPS TFT capacitive touchscreen at 9.7-inch display. The 4G networks for this tablet supports LTE 73 Mbps (up to), DC HSDPA 42Mbps, HSDPA 21 Mbps or EvDO Rev. A. It depend on your carrier of mobile provider. And of course the latest iOS 6.0 software is installed. And it's released along with the iPad mini. There is a sim card tray on iPad 4 that you need to pull out from the sim card slot to be able on inserting the micro SIM card of your mobile carrier. If you hand the iPad 4 from the rear side, the inserted card holder is placed on the right side of the tablet (pictured). There is an eject tool which you can use to eject the card tray. If you didn't find this tool, alternatively, you can use the tip of paper clip or anything similar with it. Just insert the eject tool to the eject hole beside the card slot (see the image above), then the card tray would pop out (You might need to insert and push the eject tool several time to do that, whenever the card tray is out, that means the eject process is success). Pull out the card tray then place the microSIM to the tray in position of the gold-contacts facing downward and make sure it fits with the cut-edge of the tray. After that, all you need to do just push it to the card slot until it fit and locked. Done. 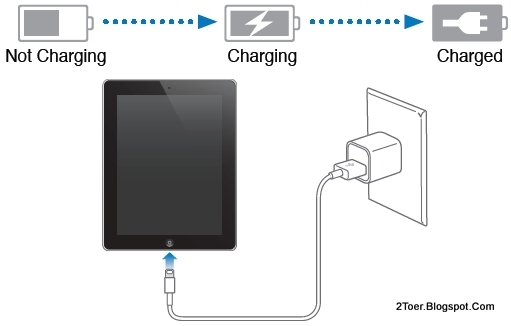 To charge 11.560 mAh Li-Po battery on this iPad 4, you can do in two alternatives: Connect the USB cable to PC or Adapter to Power Electricity. Though, the best recommendation for you is using the Adapter way. Just connect the device to USB cable, USB cable to USB Power Adapter, then plug the Adapter to Power outlet. That's it. Easy, isn't it? If the battery indicator shows the battery level in "charged" then you need to unplug the charging process. Remember the battery is non-removable, if the battery somehow leakout, please go to Apple Service Center to ask the replacement. Only an experts should be certificated to replace the battery. Turning iPad on can be done just by pressing and holding the Sleep/Wake button for about 2-5 seconds until the Apple logo appears (that the indicator you need to release the Power button). It would powered up the 1GB RAM, the dual core Apple A6X CPU and chipset, the PowerVR SGX554 GPU and of course the iOS 6 Operating System. Either way, to turn the device off, you do the same: Press and hold Sleep/Wake key located on the top side of the phone (handed in portrait position, see the image) for about 3 seconds until in the screen appears a red slider: Drag it, it would make your iPad 4 turning off. And to make your iPad back to original factory default settings (which is known as Factory Reset / Hard Reset / Master Reset), you can follow our instruction here: Go to Setting > Tab General > Choose Reset > Choose Erase all content and settings. This means all the data including email address, account name, recorded video, photos, downloaded games and apps, would also be erased and the settings also reset. But in case you don't wanna delete the contents, just choose Reset all settings instead of Erase all content and setting.